Strategies from a Board Certified Behavior Analyst on simple waysto help a child with autism make a positive and smooth transition back to school. Learn from a music specialist about how music interventions can be utilized to support social interaction for people with autism. An autism mom and former special education teacher shares her advice on comingtogether to help ASD children. The mother of a recent college graduate with Asperger’s syndrome lists what she wishes she had known when her son went away to college. Great advice from a Speech/Language Pathologist on ways to move your child toward personal thought and verbal sharing through the use of simple steps. The father of a young, nonverbal son with autism looks back on his first experience placing his child on a school bus and shares his advice on handling the big day. A specialist teacher for autism shares the need for inclusion and Autism Peer Awareness (APA) as a practice for special needs teachers. A special education teacher with Asperger’s syndrome shares excellent tips on helping autistic children get ready for testing in the school environment. Expert guidance on ways to embed language and leisure skills into your family routines. A young man with Asperger’s syndrome shares his very personal views on autism and how it has affected his life and family. Learn questions you can use to establish whether a child or young person with autism is at risk for mate crime. A heartfelt letter from a woman to her autistic twin on their 71st birthday reveals how autism shaped their special relationship. Great tips for making a visit to the dentist a positive experience for a child with autism. Top advice on the benefits of service dogs, from assisting with social skills and behavior to helping with safety and occupational therapy. The mother of a young boy with autism describes how art therapy has helped them develop a special bond. Discover Vibes Hi-Fidelity Earplugs that protect individuals with sensory sensitivities from the discomfort of loud sounds while preserving the clarity of sound in their environment. Learn about the worlds first all-in-one speech tablet for symbol-based communicators, with intuitive software, powerful speakers, and a Core Word framework. The loving brother of a man with autism shares how differently a diagnosis is viewed today as compared to more than 50 years ago, when his sibling was diagnosed. Meet the professional golfer whose son with autism inspired the establishment of the Els for Autism Foundation and the impressive Els Center of Excellence. A loving mom describes her journey with her young, nonverbal son with autism. An author, motivational speaker, and paraprofessional shares his interview with a dynamic autism advocate who was instrumental in the passage of Ava’s Law in Georgia, which requires insurance coverage for autism. Learn about two specific therapies for children with autism, their benefits, and what typical sessions might look like. Seven-year-old Brennan Farmer has teamed with his mother, Mandy, in the writing of this beautifully illustrated, relatable story about the ups and downs of being an autism sibling. A true story about two friends who save a helpless horseshoe crab, share their feelings, and work together to free the helpless animal. Learn about a new product that helps families stay connected, especially those with special needs. HELP: How Can I Make it Easy For My Son to Remember Skills? 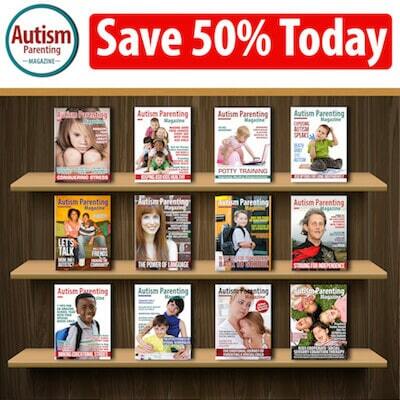 Expert advice on creative ways to help your child with autism maintain what he/she has already been taught. Expert advice on how to write a Letter of Intent for your child, as well as tips on how to find a special needs planning professional who can guide you through the financial planning process. It only takes a few minutes to prep this delectable chocolate mousse for your family. There’s no doubt about it—change is hard. Whether you’ve moved, been promoted at work, or even entered a promising relationship, new beginnings can generate stress. For some people, especially those diagnosed with autism spectrum disorder (ASD), new life chapters can create high levels of anxiety. This is particularly true when it comes to transitioning from the calm days of summer to the often-hectic school year. Different faces, routines, sights, sounds…the expectation to prosper in a changed environment can be overwhelming for kids with autism. Knowing this is an immense challenge for many, we connected with doctors, teachers, autism experts, and parents for guidance on ways to make positive transitions. Whether your child is headed to daycare, primary, middle/high school, or college, this is definitely an issue you will want to read! First, we reached out to Marisa Goudy, BCBA, of the National Speech/Language Therapy Center for some simple strategies to help autistic kids make the vital transition back to school. Take a look at her piece Successful Transitioning: the Back to School Blues, as Marisa lays out an approach you and your child can use to help prepare for the week leading up to school, the nerve-wracking night before, and the momentous first day. Another way to help the academic year go more smoothly is to make solid connections with your child’s school. Angela Conrad, a former special education teacher turned autism mom, has provided us with her sage advice on ways both parents and teachers can come together to help children on the spectrum. In her piece A New Autism Perspective: The Other Side of the Table, Angela reiterates the importance of being patient, understanding, and respectful in order reach long-term goals. For many people with autism, the very thought of exams can create high levels of anxiety. If your child experiences this type of stress, take a look at Ways to Prepare for Exams in the New School Year with Autism, provided by Kirsty Maher, BA PGDip. SEN. Kirsty, who has Asperger’s syndrome, offers excellent advice on exam preparation and concessions, and she shares the importance of providing your child with reassurance. The ability to secure healthy relationships is another key concern for many children with autism. A survey conducted by a charity in 2015 revealed 80% of respondents over the age of 16 reported to have been bullied by someone they thought was a friend. Social situations are often confusing for people with autism, making it difficult to know who to trust sometimes. Please take a look at Catherine Sarginson’s piece Ways to Help Someone With Special Needs Spot a Fake Friendship, as theHead of Learning Support at Sedbergh School, Cumbria, England,provides questions you can ask as a conversation prompt to establish whether a child or young person with autism is at risk for mate crime. This a relatively new term used to describe when people gain friendship and trust with the aim to mistreat. We tend to focus on kids when we talk about heading back to school. But what about parents and caregivers? It’s not just students who experience trepidation and worry. 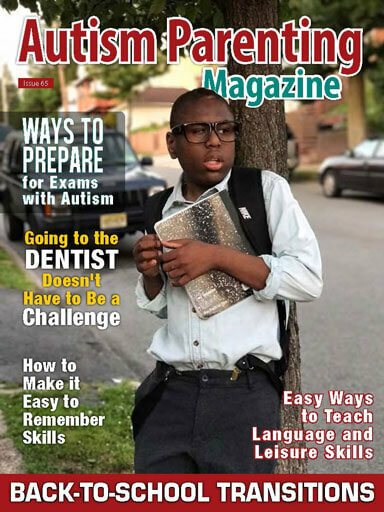 Please take a look at Bussing My Son To The World, as James Guttman shares his very personal experience placing his nonverbal son with autism on the school bus and his warm advice for other parents when handling the big day. We also have an enlightening piece written by Colleen Hittle, the mother of a recent college graduate, who shares information she wished she had known when her son with Apserger’s syndrome went away to college. This month, we are thrilled to introduce a new regular column called Autism Warrior, which has been formed to celebrate people in the autism community who work tirelessly to pave the way for autism awareness and acceptance. We chose Ernie Els as our first warrior, the professional golfer whose son with autism inspired the establishment of the Els for Autism Foundation and the Els Center of Excellence. Take a look at the piece Professional Golfer a Game Changer for Autism Community, as Ernie shares his inspiration and goals. This issue touches on so many interesting topics, from ways music intervention can support social interaction to steps you can take to encourage personal thought and verbal sharing with your autistic child. If you’re in search of fresh therapies, we have an article on the benefits of service dogs and a personal narrative written by a mother who has successfully used art therapy with her young boy with autism. We would like to thank all of the families who participated in our first cover photo contest. Congratulations to Natalya Smith, whose 16-year old son, Isaiah Noah Williams, is featured this month on our cover. We recently learned more about Isaiah’s miraculous journey from his mother, as he was born at 23 weeks and weighed in at only 1 pound 1.5 ounces. He lost his right eye from too much oxygen, which detached his retina and required surgery. Isaiah is visually impaired and nonverbal, but he understands everything and is very independent. He was diagnosed with autism at age four. Natalya will receive all of our back issues, worth $239! We also want to congratulate three additional families whose photos were so charming we requested to use them throughout this issue. Be sure to look for Asher Hufton (5), Jason Cooper (6), and Chalom Lee Pittman III (9). If you missed our contest, be sure to be on the lookout for our next one! Wishing our autism families a happy end to the summer and a peaceful transition to your next journey.